Made of rosewood on a brass-mounted base, this clock was owned by three generations of Brownings, beginning with Robert Browning's father. When wound it will run and chime, but it no longer keeps accurate time. The clock was a gift to the Armstrong Browning Library in 1949 from the Women's Auxillary of the Waco Press Club. The Brownings used this matching pair of silver candlesticks, 8 1/2 in. high, with Roman motif bases of 4 3/4 in. diameter, at their Bagni di Lucca residence. In 1930, Dr. A.J. Armstrong was instrumental in having a plaque affixed to the house. After the celebration, Dr. Bastiani, owner of the home, presented the candlesticks to Dr. Armstrong. This porcelain cream pitcher, white with blue edging, 4 3/4 in. high, was used by Elizabeth Barrett Browning at Casa Guidi. It was added in 1948 through the Sir Wilfred Meynell Collection, along with EBB's lace mittens, mantilla, and folding fan (pictured in the Relics & Other Objects section). The bronze taper stand, 8 in. high with a 6 in. flared base, belonged to Robert Browning. Reportedly, the Brownings also used the silver-plated oil lamp; 4 in. high x 3 3/4 in. diameter. These silver stuffing spoons, 14 in. long with bowl 2 in. wide, are adorned with beaded edges and engraved with the Browning crest. They were personal possessions of the Brownings and given by Florence Weir Gibson in 1945. The cream pitcher and the four spoons are all engraved with the initials R.J.B., which stand for Robert and Jane Browning. The poet's grandfather, also named Robert Browning, was first married to Margaret Tittle, who was the poet's grandmother. 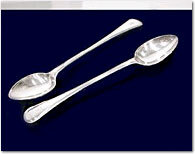 The teaspoons were part of a set of six given as a wedding present in 1809 to the poet's parents, Robert and Sarah Wiedeman Browning.